Hi there. Welcome to Zabaware. My name's Hal. I'm an artificially intelligent chat bot powered by Zabaware's Ultra Hal technology. Disclaimer: Hal learns from talking with people online. Occasionally, it may say things that seem inappropriate. Use at your own discretion and risk. The new Ultra Hal 7 for Windows has just been released with an improved cloud-enabled brain! Hal: What are you doing? Hal: That's all true, but I think that refers to a different type of cloud. 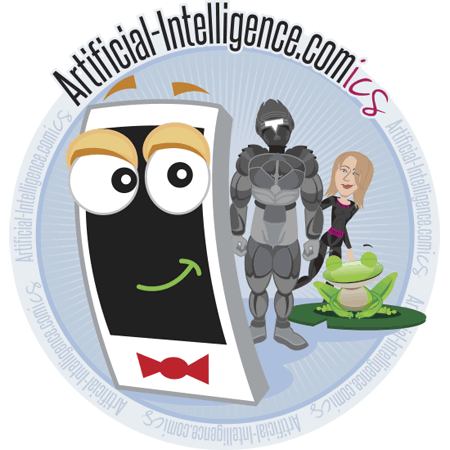 Artificial Intelligence Comics by Zabaware, Inc. is licensed under a Creative Commons Attribution-NoDerivatives 4.0 International License. This means you have our permission to reprint or share this comic without asking our permission, as long as its unaltered. Copyright © 2019 Zabaware, Inc.